A sophisticated corporate computer system and the latest software is no guarantee of efficiency if your staff is not trained in IT productivity. 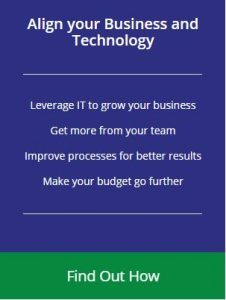 Is your system set up to provide maximum ROI or are you finding that no matter how much money you throw at it, you are not achieving the time saving and increased work capacity that you expected from your IT investment? Technology experts estimate that up to 90% of features included with software go unused. That is a staggering figure. And it’s easily fixable. Here are some tips to help you make sure small businesses are getting the most out of their IT resources. Training. Many hardware and software providers offer free training to help new users, especially smaller businesses. It’s a poor carpenter who blames his tools, the old saying goes. But, that saying may not always be true. I don’t think anybody uses actual roadmaps anymore, but the word has not died. Why? Because a roadmap has come to mean “any document that provides a route to a destination”. In the business world, a roadmap means a plan for growth. Is it a Communication or Technology Breakdown? It’s easy to blame an inanimate object. It’s harder to blame yourself. https://www.nowitworks.com/wp-content/uploads/2018/01/Shovel.jpg 548 400 Chris Meacham https://www.nowitworks.com/wp-content/uploads/2017/10/now-it-works-logo.png Chris Meacham2018-10-16 13:50:062018-10-16 13:52:23Is it a Communication or Technology Breakdown? One of the easiest examples to point to when we talk about technology helping a business is processing credit card transactions. Monday, February 12, is National Clean Out Your Computer Day. I know, you likely did not need to be reminded that the second Monday in February is already here and that means it is time to spend a few hours deleting unnecessary files and backing up your systems. Whenever I used to see my grandfather, he would always ask me two questions. The first was, “How is business?” I would invariably say something like, “Good,” or “Fine.” The usual platitudes that make up most of what constitutes small talk. His second question was more important and not usually part of any small talk kind of conversation.